Featuring a bright and open floorplan, this stylish Monterey design with Tuscan facade on the #14 hole at the guard-gated resort community of Trilogy at La Quinta is the back bone of desert living. A private courtyard with detached guest casita and pergola cover complements a 1-level arrangement of approx. 1,965 square feet that boasts 3 bedrooms, 3 baths, a great room with media niche, tile throughout & a convenient home office/den/4th bedroom with custom built-in desk/shelving. High ceilings crown every room, including an island kitchen with breakfast bar, dining area, slab granite countertops, pantry, deluxe stainless steel appliances, double ovens, tri-pendant lighting and custom tile backsplash. The luxurious master suite features a spacious walk-in closet, dual vanity, linen cabinetry, travertine counters and standalone shower. 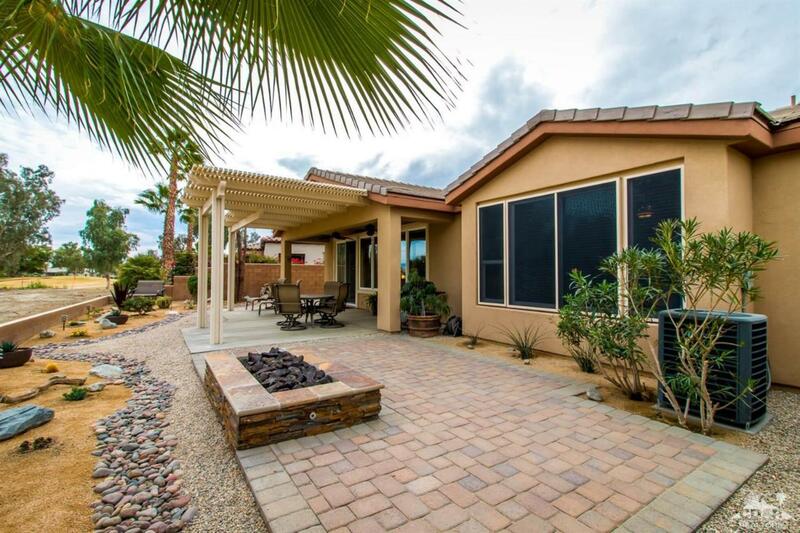 The tranquil back yard includes concrete decking with alumawood pergola, paver patio with gas fire pit, desert landscaping and amazing golf course views.